The new heavy duty DollyCrane HD features the same revolutionary design features as the standard DC but will accommodate camera and head combinations of up to 32kg, making in an ideal grip companion to more traditional feature, drama and commercial shooting packages. With the increased weight capacity, the DC HD can be used with fully built studio digital cameras such as the Arri Alexa, Sony F35 and Panavision Genesis, as well as traditional 16mm & 35mm film cameras. 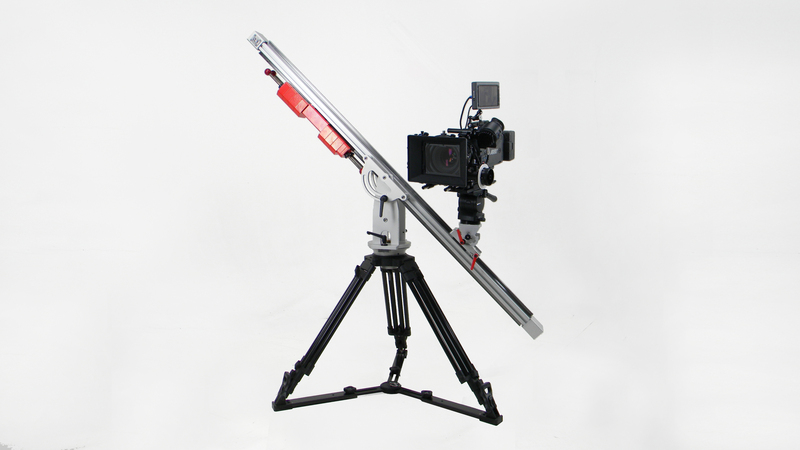 The unique counterweighted slider can be operated at almost any angle, including vertical, and also doubles as a mini-jib. The DC HD can be ordered with a MOY or 150mm BOWL fitting for use with your existing heavy duty MOY legs or bazooka. Please note, if you are using a RONFORD type tripod, please state at time of ordering as longer tower mode brackets are required for this. *Please note. Floatcam UK, Top Teks, PEC Video and Visual Impact are the only authorised UK resellers of Floatcam products. Any equipment sourced from unauthorised sources is not eligible for our UK after sales service and support. *Price correct as at 09/07/2016. Prices subject to change without notice. Subject to availability and delivery costs. 50% deposit payable with order, balance on delivery.